Of the cars that were not brand new at Peugeot’s 2014 Paris Motor Show stand, this one stood out for yours truly. Simply because the Peugeot 208 GTi 30th Anniversary Edition is a hot hatch, and we love the tiny troublemakers in this office. Launched at the 2014 Goodwood Festival of Speed in June, this one’s a bit special. More than just a cosmetic special edition, the 30th Anniversary is powered by a new Euro 6 1.6 litre THP petrol engine with 208 hp and 300 Nm. That’s eight horses and 25 Nm more than the standard 208 GTi. Zero to 100 km/h is done in 6.5 seconds, three tenths faster. The improved acceleration is matched by uprated brakes – 323 mm diameter and 28 mm thick discs up front with Brembo fixed four-piston calipers. Mated to a good ol’ six-speed manual, power goes through a Torsen LSD to the front wheels, like in the RCZ R. The ESP and traction control have been recalibrated to be less intrusive. The 30th also gets specific suspension (lowered by 10 mm) and steering settings. The track is wider by 22 mm at the front and 16 mm at the rear, to boot. The 18-inch wheels are wrapped with Michelin Pilot Super Sport 205/40 tyres. Looks wise, chrome trim have been replaced by matte black bits. At the front, the dark treatment is applied to the grille surround, foglamp bezels and door mirror shells. From the side, you’ll find matte black side skirts and wheel arch extensions. The window weather strip, which finishes with a signature paying homage to the famous 205 GTi, is also finished in the same hue, while the quarter panel bears a “208 GTi 30th” logo. The two-tone car you see here has its front finished in textured black, and lacquered red for the rear. The border is an oblique straight-cut line, as seen on the Onyx Supercar Concept. 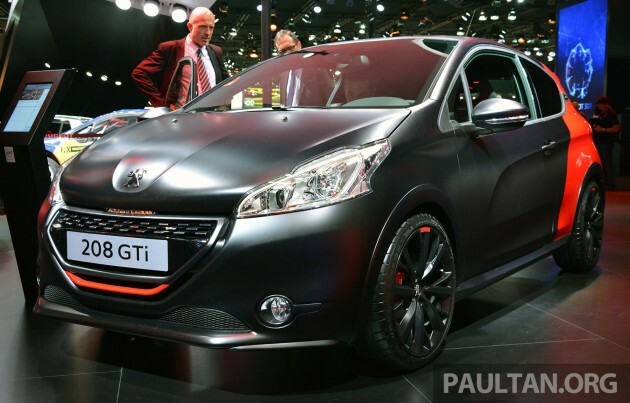 Read our review of the Peugeot 208 GTi. Been driving the 208GTi for the past 6 months and being very happy about it. That’s a lot of goodies compared to the current crop of 208 GTi. I wonder how much this car would cost if Naza do them in. this is funny, when a car come with auto, people want the manual, when its come with manual time people want auto…. Have a 6 liter deionised water in the boot.